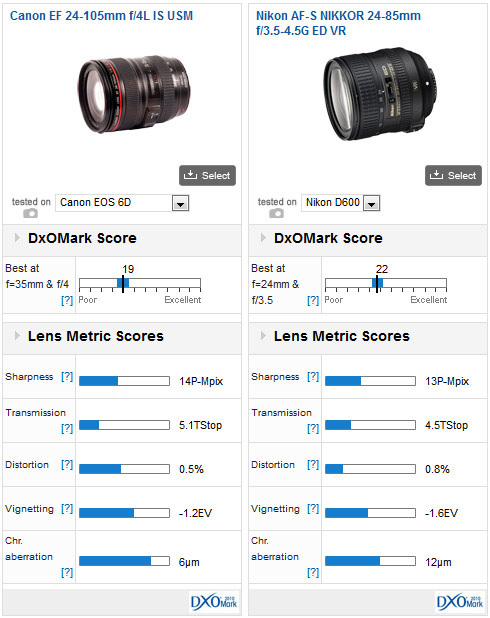 Although on paper the 20-Mpix Canon EOS 6D has a lowly pixel count compared to cameras like the Nikon D600 and Sony Alpha SLT-A99, our data shows that both the EOS 6D camera and the 22-Mpix Canon EOS 5D Mk III are able to match or exceed those cameras in sharpness when paired with the right lens. The inspiration behind this series of articles is to highlight exactly which lens models are capable of achieving this, helping you to make sound choices, either when buying new, or when wanting to deliver images with maximal image quality. We’ve analyzed over 95 different full-frame models on the Canon EOS 6D ranging in focal length from 12mm to 600mm. 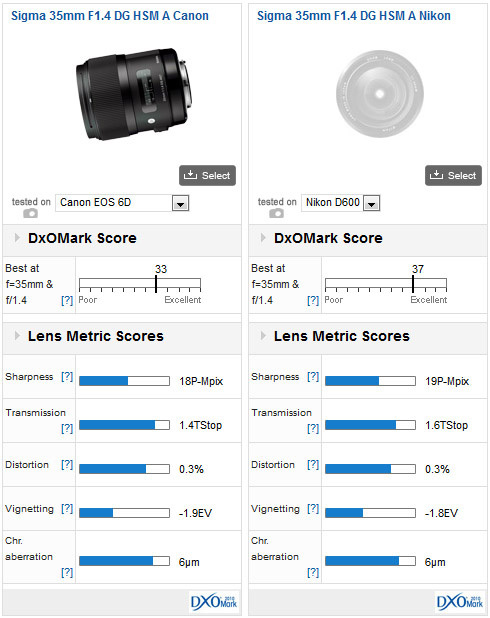 While the 20.2M pixel count of the Canon EOS 6D seems a little modest, it’s quite clear from the high DxOMark scores that the sensor is capable of delivering very high image quality and resolution. If you’ve been following these reviews you’ll have noticed that the same lenses performed repeatedly well but what is a surprise is that just how close the scores are against the far pricier Canon EOS 5D Mk III. As one might expect, Canon’s L-series lenses perform very well, as do newer models from the firm and those made by third parties. It comes as little surprise to learn the same zoom lens models appear with a very similar ranking, although it is a shock to see the much-vaunted Canon EF 24-70mm f/2.8 L II USM equaled by the new Tamron in our benchmarks, even if there was only one point in it before. In general, however, we’re not seeing any difference in performance over the Canon EOS 5D MK III with the less capable lenses, and even with the best lenses there’s only the narrowest of margins between them. 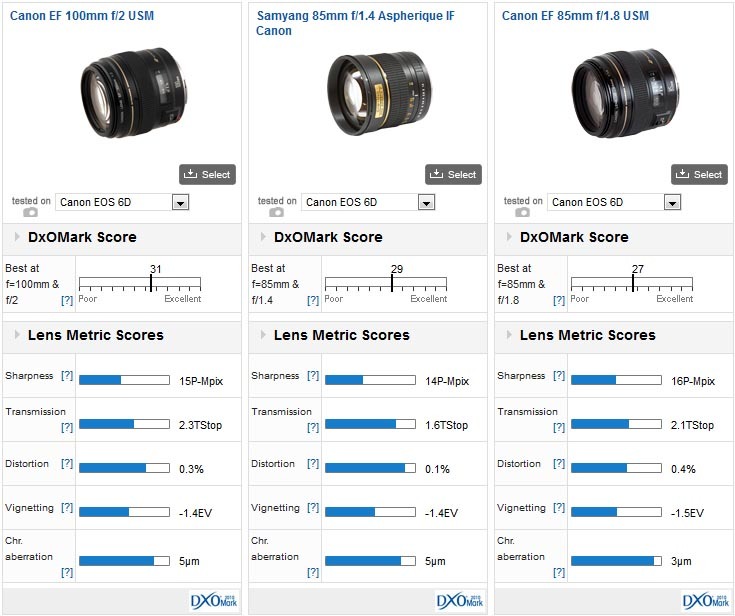 Looking at some of the best performing lens models, we can see that the Sharpness (P-Mpix) scores for the two cameras show a similar efficiency and that the 10-percent or so extra pixel count may the reason for the slight advantage. 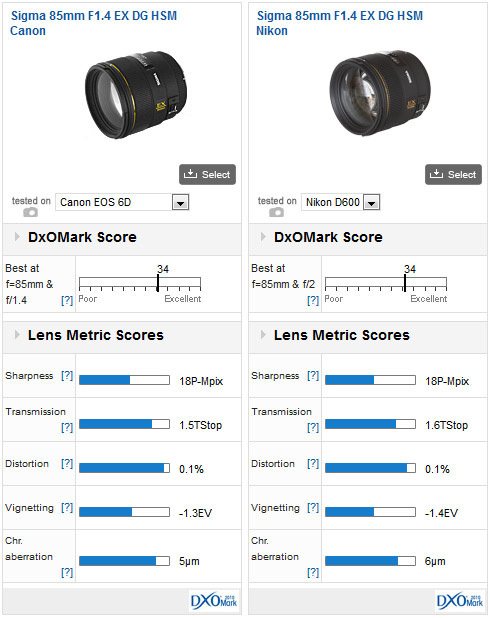 However, now if we look at the overall DxOMark benchmarking scores (which assess the overall IQ by taken into account sensor’s noise, color behavior and dynamic) the differences are less noticeable. If we compare the Canon EOS 6D with it’s nearest rival, the 24Mpix Nikon D600 some interesting facts emerge. On one of the best performing lenses that we can test on both cameras, the Canon EOS 6D pairing can match the Nikon equivalent in sharpness and in DxOMark score. Looking at another set of benchmarks, this time using the Sigma 35mm f/1.4 DG HSM A on both cameras, the Nikon model has the edge thanks to a better sharpness homogeneity. Let’s now examine the two models with lenses from their maker’s own factories. Both lenses are highly regarded, but despite the Nikon lens being the newer of the two and the 4-Mpix advantage of the D600, it’s the Canon pair that are the more capable in outright sharpness, at least when averaged out. Both lenses differ quite a bit in image quality over the focal range, so it’s not exactly clear-cut, however, the Canon is disappointing for its transmission. Overall though, the despite the obvious differences in pixel count there are a few occasions when the modest 20Mpix CMOS of the Canon EOS 6D is capable of matching the 24Mpix sensor in the Nikon D600 in both acutance and sharpness. Nonetheless, while there’s less advantage in sharpness than the difference in pixel count suggests, the Nikon D600 sensor is a better performer in other ways (such as Dynamic Range and Noise – please see here for our sensor comparison). Sharing the number one spot for the best performing standard or ‘normal’ lens for the 20Mpix Canon EOS 6D is the $499 Sigma 50mm f/1.4 EX DG HSM, the macro-oriented, manual focus Zeiss Makro-Planar T* 50mm f/2 ZE and the ultra-compact and portable Canon EF 40mm f/2.8 STM, each achieving a DxOMark score of 28. In second place, Canon’s ultra-high speed EF 50mm f1.2L is a popular choice for imaging pros but with a price of just under $1,600 this isn’t an option for everyone. Canon’s value proposition for a high-speed lens is the modest EF 50mm f/1.8 II. At just $99 it’s the most affordable lens in the firm’s range. 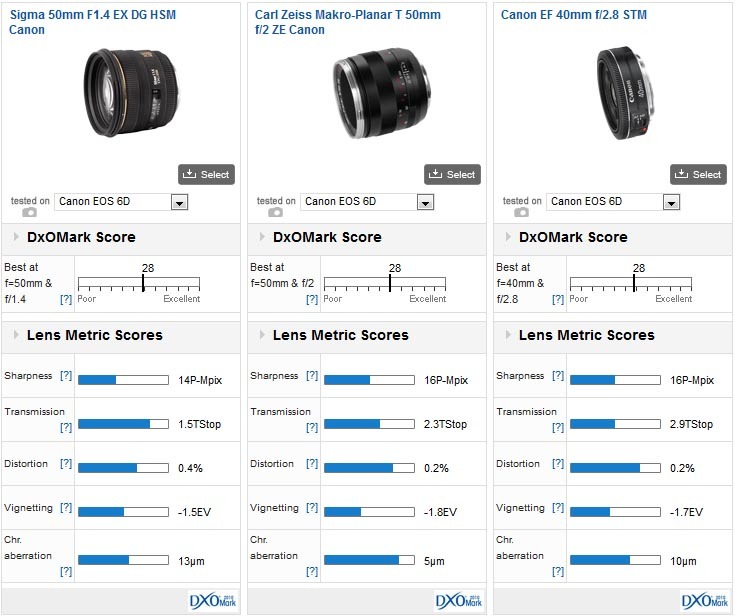 All three lenses share the same DxOMark Score but this is a benchmarking exercise to compare the overall image quality of the lens and camera in use. To assess the relative optical qualities of the lenses the individual metrics should be compared. In overall sharpness, the Zeiss and Canon compare favorably and offer consistent performance across the field over the aperture range. The Sigma’s full aperture performance, on the other hand, isn’t particularly impressive which accounts for the lower overall score. 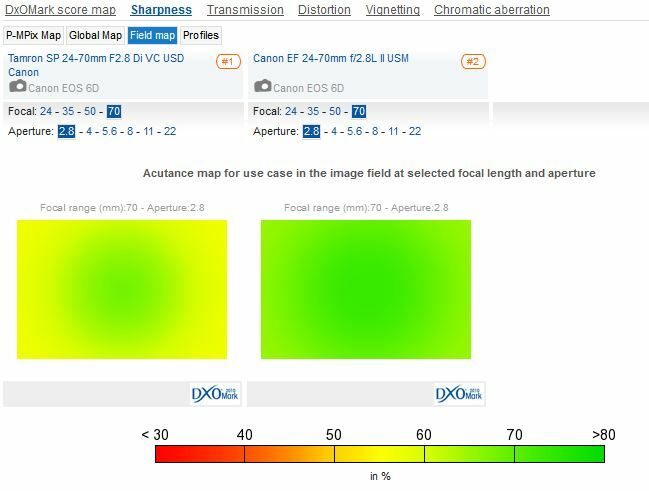 For more in-depth comparisons, we recommend studying the sharpness field maps, here. In other respects the lenses fair well. As we’ve noted before, with a DxOMark Score of 34 points, the Sigma 85mm f1.4 EX DG HSM is a superb performer optically and it performs equally well on the Canon EOS 6D. At £969, it’s a pricey option, and at odds perhaps with the more modest, entry-level aspirations of the Canon EOS 6D. The same can be said for the excellent Zeiss Makro-Planar T* 100mm f/2 ZE. At $1,840 it’s a rather specialist, manual focus only macro-lens (though it will serve double duty as a excellent portrait lens, albeit a rather sharp one). Canon’s L-series lenses are equally impressive but also releatively expensive. Of the three lenses compared, the Canon EF 100mm f/2 USM doesn’t quite have the sharpness of the firm’s EF 85mm f/1.8 USM but it achieves high overall DxOMark Score on the Canon EOS 6D, putting it in second place behind the pricier and much heavier Sigma 85mm f//1.4. Achieving a decent DxOMark Score of 29, the best value based on optical quality must be the Samyang 85mm f/1.4 Aspherical IF at just $285. Remember this lens is manual focus only and it lacks the usualdata-bus connections of the EF mount, meaning there’s no aperture control from the camera (limiting the choice of exposure modes) and only stopped-down metering can be performed. Tying in top place, predictably, are the two new 24-70mm f/2.8 lenses from Tamron and Canon, which in turn are followed by Canon’s previous iterations, the EF 28-70mm f/2.8L is now only available on the second hand market, while the EF 24-70mm f/2.8L is now unlikely to be found new. While the two current lenses vie for the top slot, for around $1,000 less than the Canon model the Tamron seems to be the better value, based on optical quality at least – professional users will likely value the durable build of the Canon. If working on a lower budget, the older more modest Tamron SP AF 28-75mm f/2.8 XR Di LD Aspherical IF lacks an ultrasonic AF motor and stabilization but at $499, it achieved a very respectable DxOMark Score of 20, just one point less than the $899 Sigma 24-70mm F2.8 IF EX DG HSM Canon. 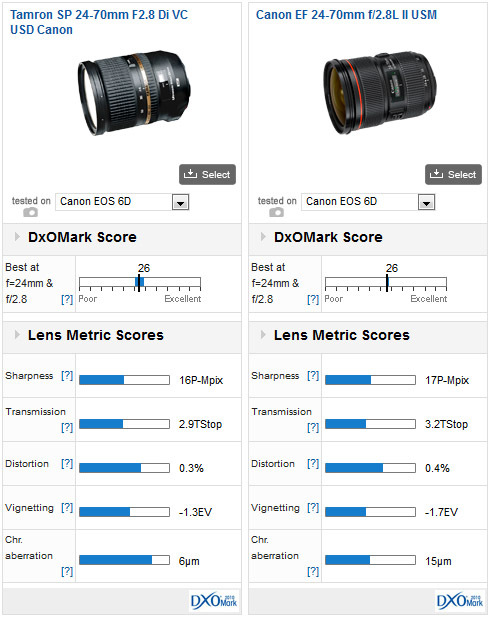 Although the pair achieve the same DXOMark Score of 26 points, the Canon has been optimized for Sharpness and has excellent uniformity across the zoom range, and at full aperture and each aperture setting thereafter. With performance close to that of some primes it’s one of the reasons why the Canon costs what it does. The Tamron, on the other hand, is similarly sharp at 24mm but fails to match the Canon across the frame (corner-to-corner) at full aperture over the rest of the focal lengths. One stop down from the maximum aperture, though, and the Tamron performs very well indeed. The Tamron SP24-70mm f/2.8 performs similarly to the Canon at 24mm but can’t match that model across the field at full aperture over the rest of the focal lengths. With that in mind, the Tamron also has better transmission (2.9 v 3.2 TStops), slightly lower distortion and vignetting and, surprisingly lower chromatic aberration. With the Tamron offering stabilization, weatherproofing and featuring an ultrasonic AF motor, this lens is a convincing alternative to the pricier Canon model. Please look out for the Part III – Best wide-angle and telephoto lenses for the Canon EOS 6D. 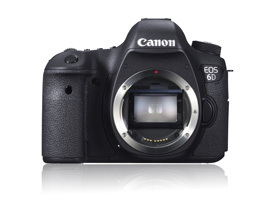 If you have a Canon EOS 6D and a favorite lens, we would very much like to hear from you. Please leave a comment below stating what model it is and why you like it. As with the Canon EOS 5D Mk III, the Sigma 35mm f/1.4 DG HSM sits at the pinnacle of high-performance wide-angle primes, and at $899 it’s priced aggressively enough to tempt the most ardent and loyal Canon supporters. It is a very large and weighty lens even for a fast aperture 35mm, and it that’s a concern perhaps the slower but lighter and more portable stabilized Canon EF 35mm f/2 IS USM ranked in second place with a DxOMark score of 31 points may be more suitable. Like others in the range from Korea based company, the Samyang 35mm f/1.4 AS UMC performs very well optically for the price, just $599, but the lack of AF may be a concern. For versatility when shooting landscapes or interiors, the ultra-wide zoom is a popular choice. The best performing model we have in our database is the Tokina AT-X 16-28 f/2.8 PRO FX and while not having the same range or versatility as the Canon EF 16-35mm f/2.8L II USM, at $849 it’s more accessible to those who might be on budget. With a wildly convex front element and a fixed hood the Tokina isn’t really suited for use with filters, which is a must for landscape photographers. While we’ve not yet analyzed the $740 Canon EF 17-40mm f/4L USM or the new Tokina equivalent, the choice is somewhat limited. 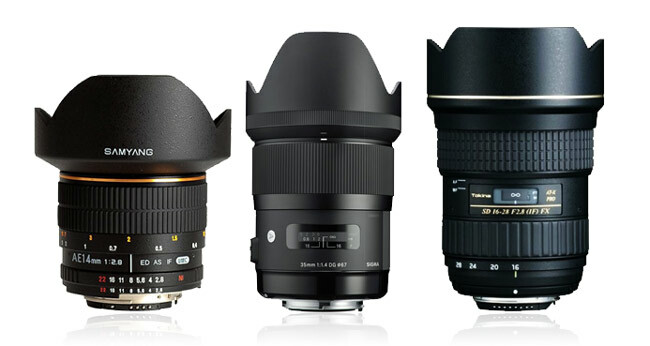 Sigma once offered several models but that’s now limited to just one, the 12-24mm f/4.5-5.6 EX DG HSM II. Although it achieves a somewhat lowly looking DxOMark score of 15 points bear in mind this is the widest rectilinear lens currently available (and is priced accordingly). The best performing ultra wide prime is perhaps somewhat surprisingly, the Samyang 14mm f/2.8 IF ED UMC. At just $379 it achieves a higher DxOMark Score than the $2,950 Carl Zeiss Distagon T* 2,8/15 (15mm f/2.8) ZE. While both models are manual focus only (and not really an issue in a ultra-wide, in fact it’s probably preferable) the Samyang is also considerably lighter and more compact than the Zeiss. In third place is the Zeiss Distagon T* 2,8/21 a highly regarded lens known for its high imaging performance and distinctive rendering though it has some slight complex distortion that is difficult to correct in software. 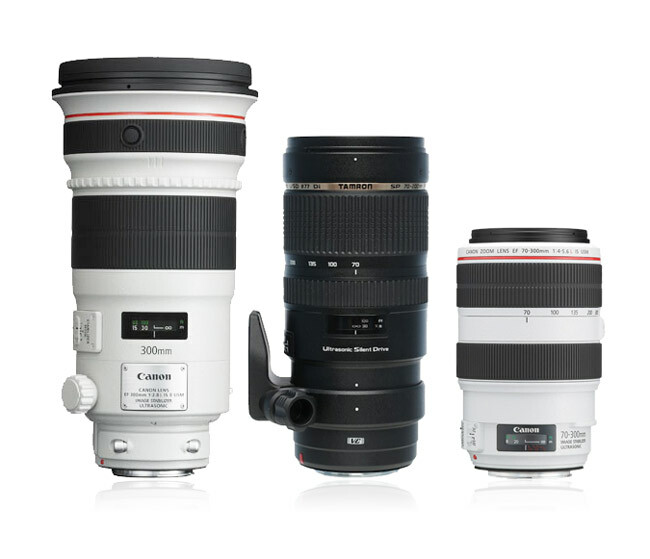 Canon’s white telephoto lenses have become synonymous with sports and wildlife photographers around the globe, but with their high price and specialist application, these ultra-high speed super telephotos are by and large inaccessible to the majority of users. The best performing model in the range is the recently revised Canon EF 300mm f/2.8L IS II USM at $6599. It sits two points above the Canon EF 400mm f/2.8L IS II USM, an arguably more versatile model well suited to use with the firm’s 1.4x and 2x extenders, where it becomes the equivalent of a 560mm f/4 and a 800mm f/5.6, respectively. At $10,499, plus $450 or so for each converter, it’s not for the faint hearted. For those with more modest budgets or those simply wanting a more compact, more portable model, then the stabilized Canon 300mm f/4L IS USM is a solid performer. Macro enthusiasts should consider the stabilized Sigma 150mm f/2.8 EX DG OS HSM APO Macro. It’s a slightly better performer than Canon’s aging EF 180mm f/3.5L Macro USM and will save in the region of $400. Telephoto zooms are rightly popular and have for the most part replaced their fixed focal length primes equivalents such as the 135mm f/2.8 and 180/200mm f/2.8 lenses. Although Canon makes several highly regarded 70-200mm models, including the recently revised $2,499 EF 70-200mm f/2.8L IS II USM, the best performing lens in our database is the Tamron SP 70-200mm f/2.8 Di VC USD. At $1,699, it’s still not cheap but with a DxOMark Score of 27 points it’s a slightly better performer than Canon, while also offering optical image stabilization and an ultrasonic-type AF motor. If those last two features aren’t high on your wish list, the older Tamron SP AF 70-200mm f/2.8 Di LD (IF) Macro would be our budget choice, achieving a not unreasonable 21 points in our DxOMark score. As know how and image-quality improves, super-zooms are becoming increasingly popular. With a little longer focal length and higher magnification than the 70-200mm, the 70-300mm models offer a tempting combination of versatility and, usually, attractiveprices. From our findings we can see the highest performing model, currently the Canon EF 70-300mm f/4-5.6L IS USM, isn’t too far behind the majority of the 70-200mm f/2.8 offerings. And while it has a slower maximum aperture of 1-2 stops over the zoom range, the Canon L-series model has image stabilization and fast autofocus thanks to the ultrasonic AF motor. If price is a concern then the $195 Canon EF 75-300mm f/4-5.6 III USM may be an option. Photographers looking for advice on more specialist models may want to consider the Sigma 120-400mm f/4.5-5.6 DG APO OS, or even the Canon EF 28-300mm f/4.5-5.6L IS USM but these models are designed with flexibility in mind rather than outright image quality.